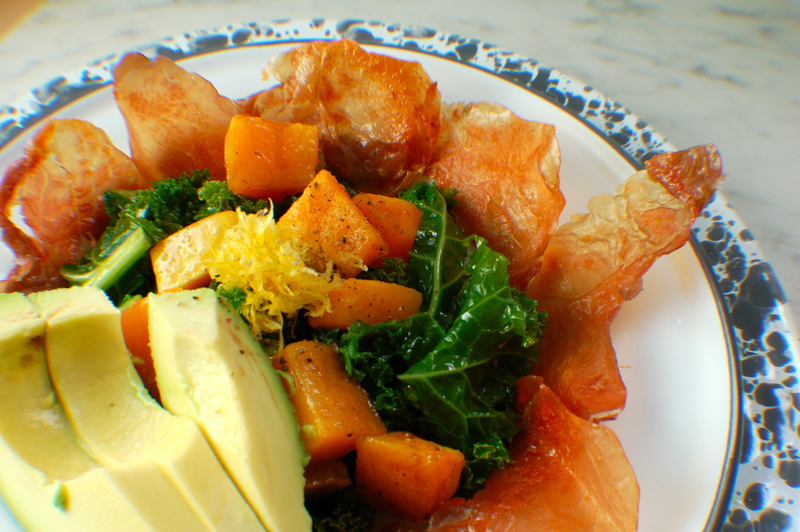 Crispy Prosciutto, Butternut Squash, and Kale Salad. Bowl and plate by Crow Canyon Home. Ahhhhh, it’s fall again! Harvest-colored leaves, fresh crisp air, winter squashes, and, if you live in San Francisco, freakishly warm weather. While it’s 80 degrees and sunny outside, my Farmer’s Market is bringing to me (and you) some delicious squashes this fall. Acorn for baking, spaghetti for pasta substitutes, and butternut for roasting. So we’ll take this gift of butternut squash from fall Farmer’s Market and pair with late season avocado and crispy proscuitto. Finish this salad off with a little lemon zest and you have yourself a complete, perfectly balanced, Paleo salad (see!? 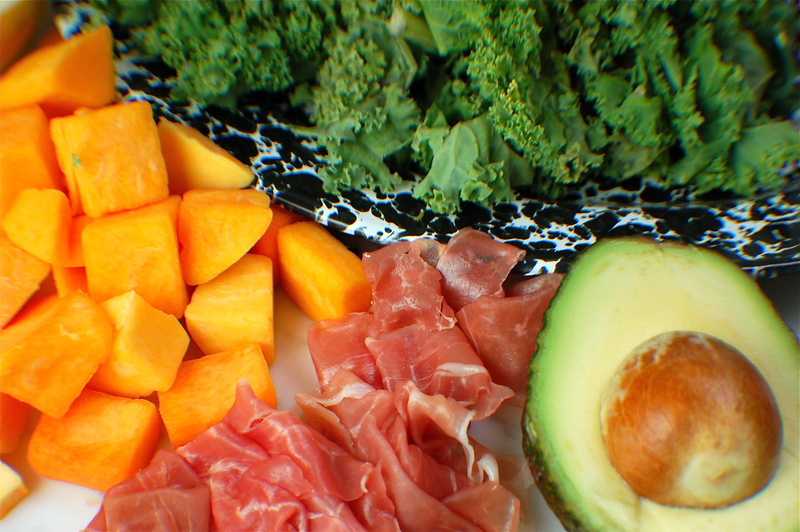 Paleo CAN be tasty!). So whether you’re cozying-up like my sister in Portland with rain and 50 degrees or with me with sun and 80, you can feel good about this delicious, healthy fall salad. I’d like to note two things before we start this recipe to settle any angst you may have about making this gorgeous salad. 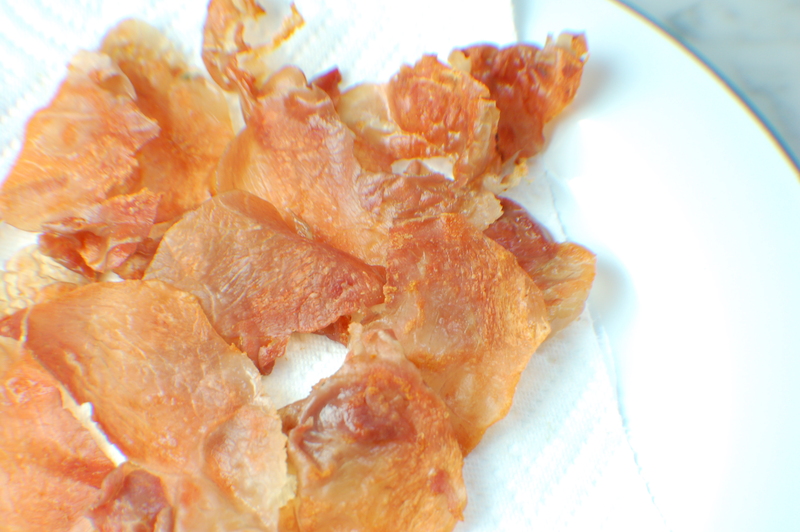 One: Crispy Proscuitto is hard to spell but not hard to make. 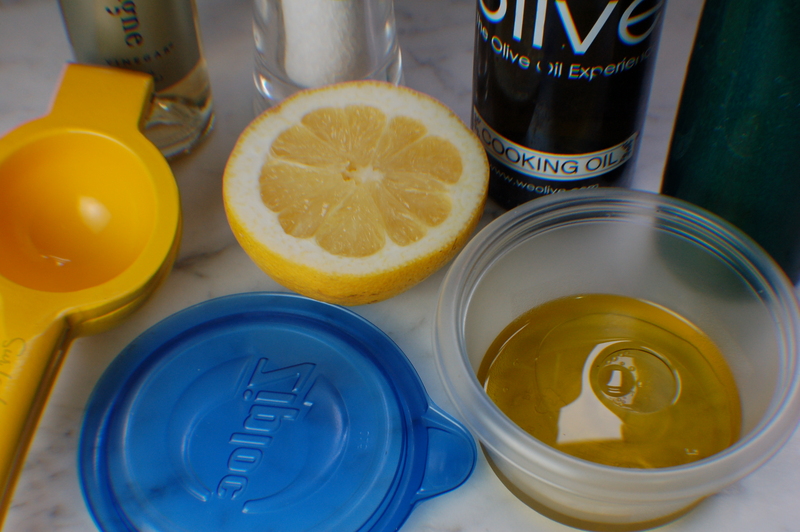 Two: I’m going to show you the easiest way to make your own salad dressing. In sum: this recipe is easy. Easy like Sunday Morning (laaaa-aaahh-aaaahhh-aaahhhh….cause I’m easaaay). Now that you have the confidence and song in your head, let’s get cooking. First, start by roasting the butternut squash. Preheat oven to 400 degrees. 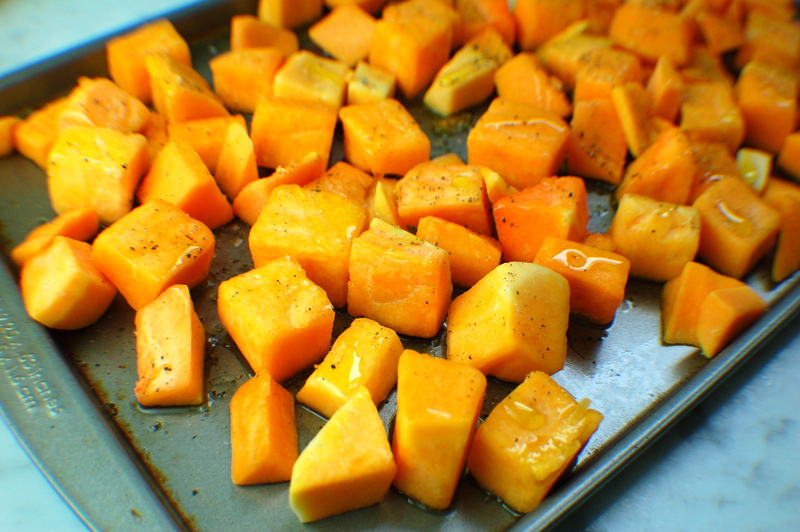 Peel the squashes hard outer layer, cut in half, scoop out seeds, and chop into 1/2 inch cubes. Or just buy the pre-cut stuff at Safeway. Toss the butternut squash in the olive oil, sprinkle salt and pepper generously, and place squash on a single layer on a baking sheet. Bake in the oven for 15-20 minutes until slightly browned. 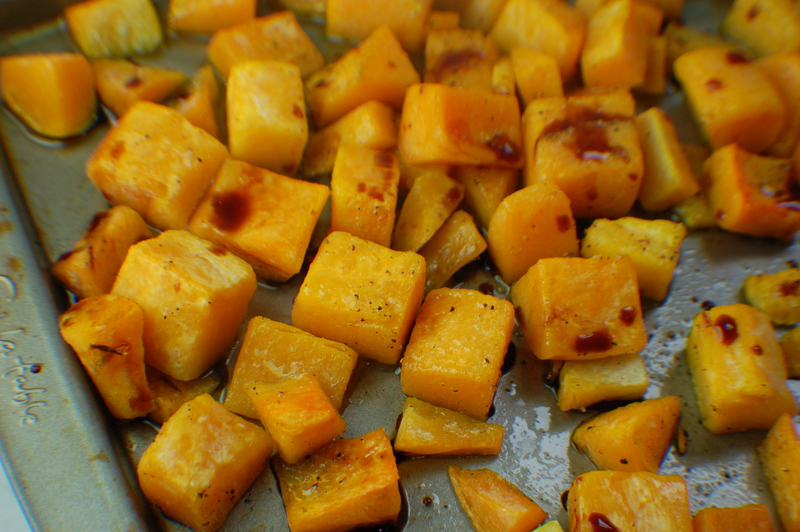 Roasting not only softens the squash, it also brings out a carmel-y, sugary flavor that balances well with salty proscuitto. Start a large pot of salted water on the stove (to use for blanching kale later) and an ice-bath in a large bowl (for cooling kale later). Prepare the crispy proscuitto. 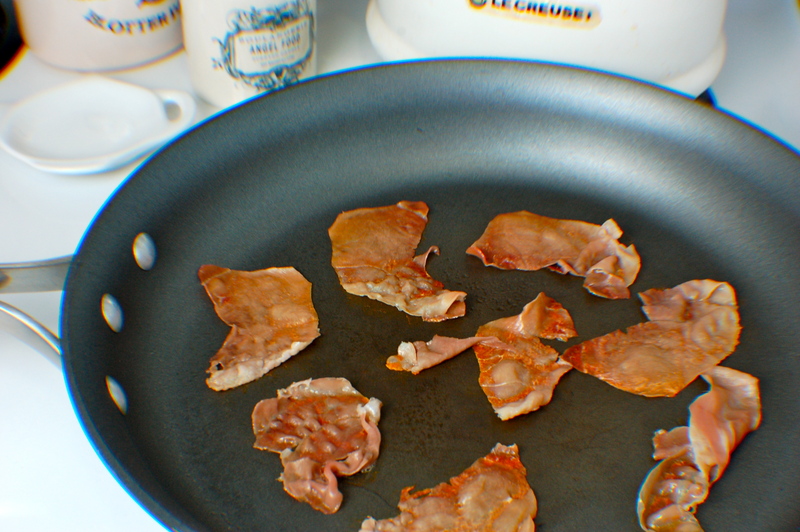 In a non-stick pan over medium high heat, place large pieces of proscuitto and cook until slightly browned on each side. Set aside on a towel-covered plate to cool down and soak up excess oil (this is how they crisp up). 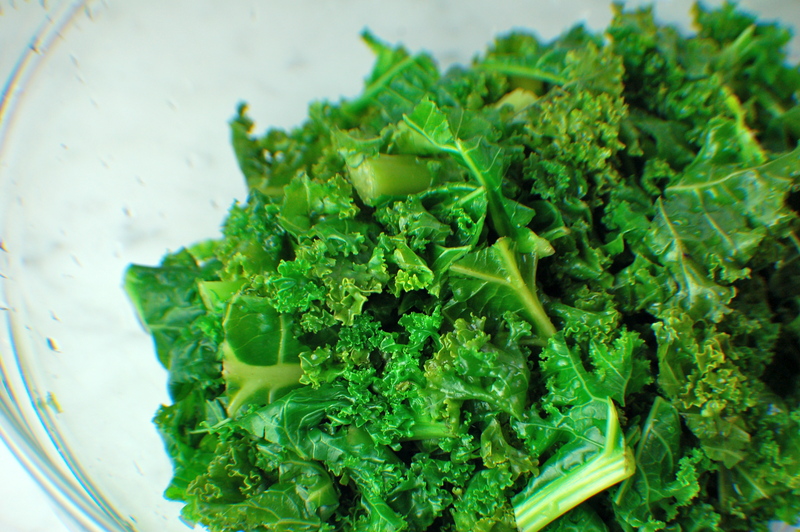 Wash kale and cut into small pieces. Blanch kale in boiling water for about 2 minutes or until it turns a bright green. Use a slotted spoon to remove the kale from the boiling water, then quickly “shock” the kale in the cold water and drain. 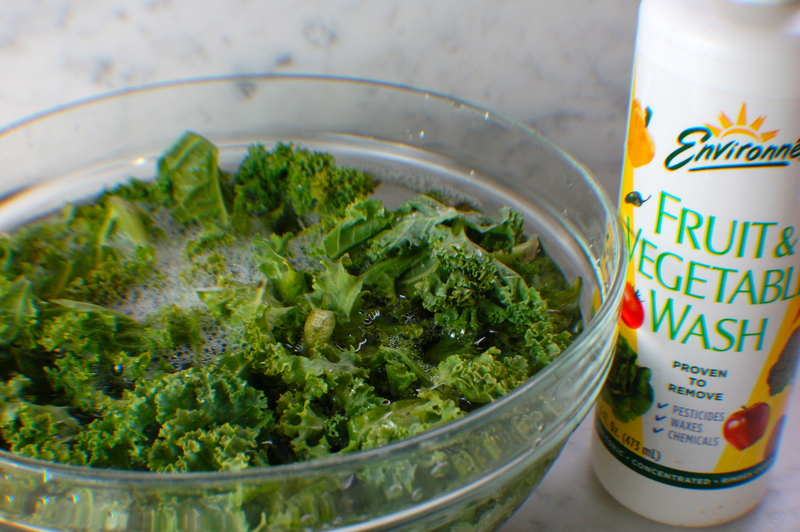 This stops the cooking, cools the kale, and helps the kale retain the bright green color. I’m washed and ready to go! Now make the salad dressing. This is my easy, cheater emulsification. Technically, you should whisk or use a food processor to make sure all ingredients perfectly emulsify (a process whereby water-soluble ingredients surround the globules of oil-ingredients to blend together into a perfect single dressing). As you’ve found, I love shortcuts and anything that requires me to clean one fewer dish. I put all ingredients into a tupperware and shake it like a polaroid picture. Now, to prepare the final salad. 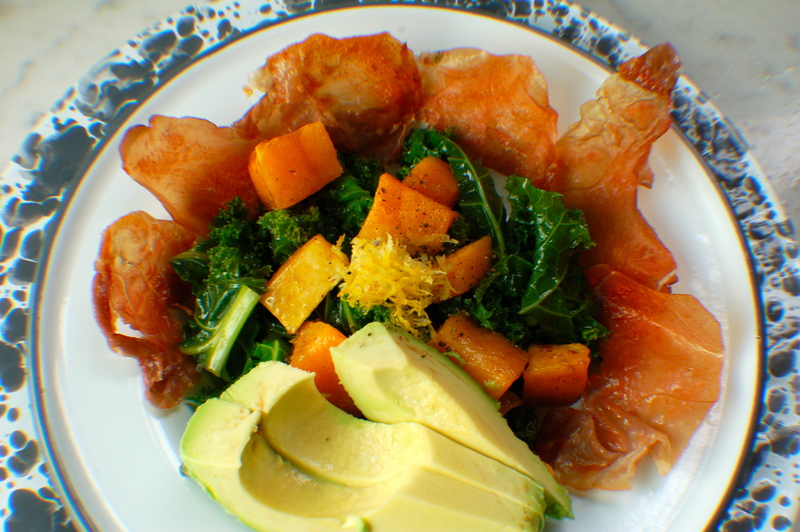 Toss kale lightly in salad dressing, place crispy proscuitto around the plate, add roasted butternut squash, avocado, and lemon zest. And wherever you are, in whatever weather, you can cozy up knowing that this salad is healthy, balanced, delicious, and bringing you all the comforts of fall and homemade cooking.